Gus: We have a guest selfie taker today. Meet Dante the cat intern at the Mama's office. 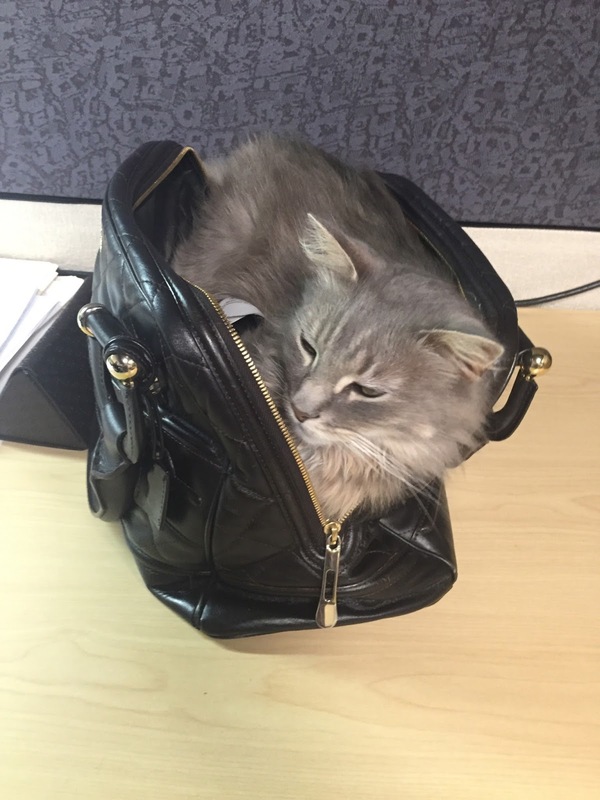 I think Dante was trying to hint to a co-worker that he needed to go home with her. Never fear though, Dante was adopted by a nice family this weekend so he got his furever home after all. Speaking of adoptions - both Scarlett and Rhett were adopted! Scarlett had nothing to fear. She was only at the adoption center a few minutes before she found her family. Rhett took his time waiting until the right little boy came to visit him. He and his little boy are going to have so much fun together! I hope we hear what they decide to rename Rhett. Some potential names where Mike Claws, Bobert, and French Fry. But that's not all! Remember Mama's cat intern, Bo? She was adopted too! This weekend Great Plains SPCA had one of their biggest adoption events of the year. Friday and Saturday 282 animals found their furever homes. Isn't that amazing???? Congratulations to all of them! 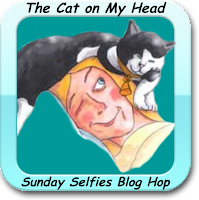 This post if part of a blog hop hosted by The Cat on My Head. Please hop on over to see the other entries. And HOLY CAT on all the successful adoptions by Great Plains SPCA ... awesome! Now THAT is news I like to hear ADOPTIONS!!! Thank you forever homes and families! Rhett won't stay Rhett for long I reckon!!! So glad to hear when forever families are found. Nice to hear so much good news. Looks like Dante found the perfect place for a nap! Way to go Dante! Hooray for so many wonderful adoptions! YAY! Hip-hip-hooray for adoption mews!! Such good news and hurrah for Dante. Fantastic news all around! Too funny that Scarlett was scooped up in minutes...TORTIE POWER!!! I love hearing about adoptions! It was a great weekend for adoptions!!! The adoptions are very good news! Yay! Such great adoption news! Dat's pawsum mews. WooHoo Kitty dance time. Yay for all the adoptions! That's wonderful! Wow! Paws up for all the adoptions!